The new WH Series Compact Transit Escalator Drive range comprises 5 footprint options to provide easy interchangeability with other manufacturers. The compact design drive is available as motor ready or fitted with a vertical motor, brake and flywheel package for in-truss installation. 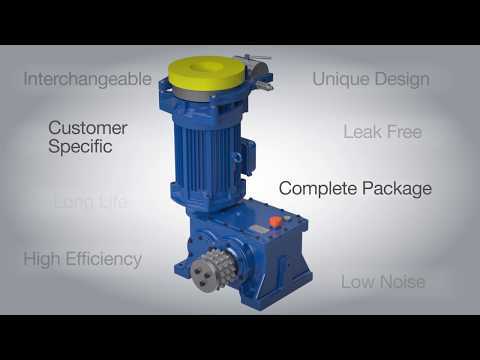 Incorporating the unique Renold Holroyd Worm Gear Form on the high speed input stage and a helical gear on the second stage, the worm / helical combination is designed for high efficiency and low noise. The unit also benefits from Renold's low oil level technology which reduces operating temperature and extends operating life. Optional use of non-contact labyrinth seals ensures that the new units are leak free. Unique case design ensures interchangeability with other manufacturers without the need for re-engineering. Compact design available as motor ready or fitted with a vertical motor, brake and flywheel package for in-truss installation. Worm / helical combination unit designed for high efficiency and low noise. Uses Renold's low oil level technology to reduce operating temperatures and extend operating life. Optional use of non-contact labyrinth seals ensures that the units are leak free.